Both countries benefited tremendously from their close economic ties. A prevailing view among policymakers and strategists in Washington seems to be that the United States has been betrayed by China. This is because despite over three decades of “constructive engagement,” China is neither democratic nor docile. Instead, today’s China is authoritarian and increasingly assertive in its domestic and foreign policies. Thus, a deep sense of having “created Frankenstein’s monster” is popular among American strategists. A closer analysis would reveal that such a view is not only misguided but also dangerous for U.S.-China relations in the future. The first major problem with this view is that it is not consistent with the history of U.S.-China relations. It very much sounds like the United States simply handed “modernization” as a gift over to China in the last 30 years or so. This view is flat-out wrong. It not only neglects the huge benefits that China’s exports to the United States have on the U.S. economy itself, but also utterly downplays Chinese agency itself. Here is not the place to explain in detail how China’s economic success has come about, but there’s one thing we can be sure of: China’s success so far would be impossible without its millions of hard-working and skilled laborers. Moreover, it is not like the United States opened its market access exclusively to China. The U.S. only granted China normal trading status, just as it did for many other Asian states. Market access itself did not result in China’s modernization. If access to the U.S. market could help a developing country develop quickly, then countries like India and Brazil would have already become economic powerhouses many years ago. The reality is not that simple, of course. To successfully move up the economic ladder, a country needs smart government policies, hard-working people, abundant natural resources, and a huge amount of foreign investment, just to name a few necessary conditions. A bit of luck helps too. 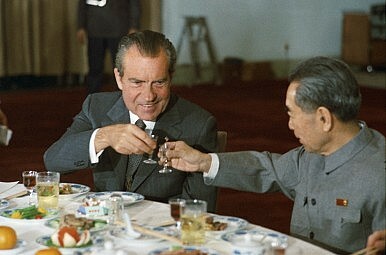 Moreover, as former U.S. President Richard Nixon himself later admitted, the real reason to engage China was not to help China modernize; it was rather to play the China card to balance the common threat of the Soviet Union. That realist strategic thinking, of course, indirectly helped China gradually become an economic powerhouse. But it would be wrong to argue that the U.S. selflessly helped China modernize over the last three decades. It was simply an unexpected outcome of their relationship. Not only did the United States not see this coming, the Chinese didn’t either. To be sure, China should be grateful that many Americans and American companies did try to help China modernize, and Chinese people will not and should not forget them. China is richer now and this is why it and the United States should work together to help less developed countries develop. Whining about how China has not turned out the way the U.S. had hoped is not going to help strengthen U.S.-China relations. It is time now for the U.S. to accept a different and strong China, no matter how uncomfortable it might be. To continue to view China through an ideological lens will lead to a new type of Cold War between the two largest economies in the world. That would be a tragedy, to say the least. Most importantly, the United States should be patient with China’s progress. Given China’s history, culture, and still relatively modest developing living standards, its road to a modernized political system will be long and bumpy. Now is not the time for the U.S. to conclude that there is no hope in China. Instead, Washington should double its efforts to constructively engage China and ultimately shape China’s future choices. This strategy, eventually, will pay off, but it also requires a huge amount of confidence and patience. Time is on the United States’ side, especially if American strategists truly believe their system and values are universal. These diverse views show that China is still debating how to handle an increasingly aggressive United States. How Can the US Manage a Rising China?Not So Fast: The TPP Might Be Good News for ChinaThink Xi Jinping's State Visit to the US Went Well? Think AgainWondering Why China Held Its Parade? Here Are 5 Things Beijing Accomplished.Must the United States Fight China?